Clean-tech innovator APATEQ has been awarded with the Green Technology Award at the Luxembourg Green Innovation Summit 2017. APATEQ was honoured for its containerized water treatment system “WaterPaq”, using innovative technologies that enable to treat different streams of water with one single installation to an effluent of fresh (drinking) water quality. APATEQ engineers and manufactures high-efficiency water and wastewater treatment systems based on unique and innovative process technologies. The company is winner of this year’s Green Technology Award, honoured by Farvest at the Green Innovation Summit. 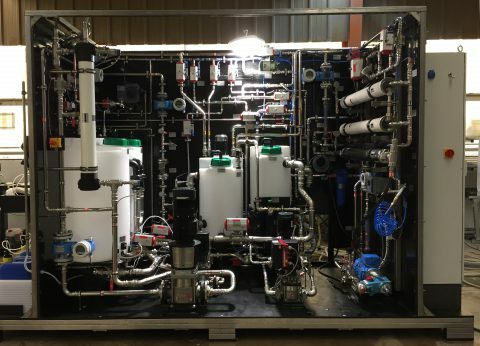 The clean-tech company has been awarded for its second generation of WaterPaq, a compact multi-purpose water treatment system that treats water and wastewater from different origins with one single installation, producing an effluent of fresh (drinking) water quality. This multi-functionality is possible due to dedicated software developed in-house and a mix of different technologies that APATEQ master. The new generation of WaterPaq is perfectly suited for an operation at any places where water is scarce, including remote locations such as islands, villages or resorts. It can support these communities to become independent in terms of water supply and to avoid any risks of water shortages. As the WaterPaq presents a unique solution to treat water of different origins to an individually required effluent quality, only a limited investment for the community is required. Besides, environmental pollution and disturbances caused from (fresh and waste) water transporting are avoided. The fully automated WaterPaq can be quickly commissioned and operated remotely. The system is easy to handle for communal employees who do not necessarily have extensive experience and training in the field of water treatment. The Green Innovation Summit identifies and honours leading developments in the clean-tech sector and brings together the domestic clean-tech community. This year’s event took place at the artisan confectionery Namur in Luxembourg on 19 October 2017.